This highlights the incredible population density of the southeast corner of Asia. Of course this is great for Australia as according to Visual Capitalist there are now at least 3.8 billion people living inside the highlighted circle. 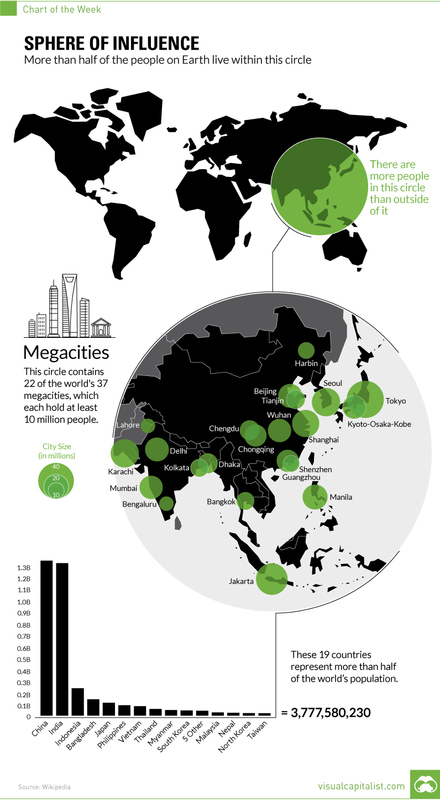 The circle holds 22 of the world’s 37 megacities – massive cities that hold at least 10 million inhabitants. 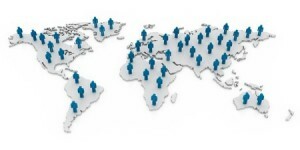 It also includes the five most populous cities on the planet: Tokyo, Jakarta, Seoul, Karachi, and Shanghai, which alone combine to hold 144.5 million people. This geographical region also holds many of the emerging markets of the future, countries that the World Economic Forum expects will lead global growth in years to come. Vietnam, Myanmar, Philippines, Indonesia, and Bangladesh are in the area highlighted, and Pakistan is partially there as well.